Sandra Eula Lees work is inspired by the temporary structures built by residents in Beijing where neighborhoods underwent constant demolition and relocation of communities. These structures include make-shift stands, small impromptu gardens, and improvised spaces. Her installation pays tribute to the enduring human spirit found in these everyday creative acts. 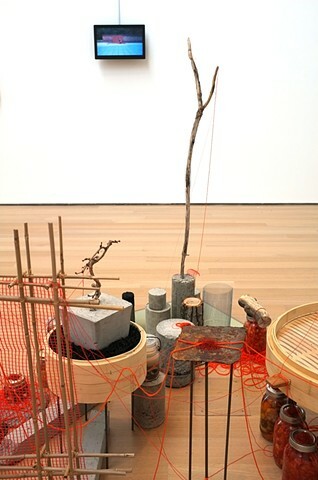 Lee draws upon centuries-old Asian garden design for her sculptures and installation. However, in her garden hacks, rock and bamboo coexist with chunks of asphalt, concrete, and other industrial materials of construction. Hand-made containers of Korean spices and fermented vegetables connect with transformative potential.